I've had Spiral Solutions Deeply Decadent Treatment since April 2011, and still can't seem to finish it. I just don't like it. It isn't a bad product, but it didn't wow me in the least. 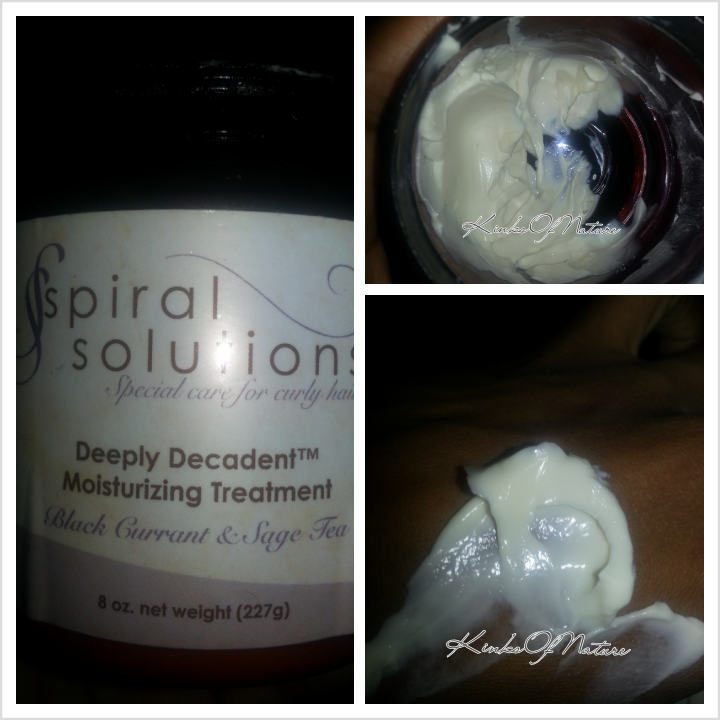 Product Claims: Spiral Solutions Deeply Decadent Moisturizing Treatment is an intensive treatment on your hair. In less than an hour, you'll be enjoying beautiful, moisturized, soft, gorgeous hair! The texture of this treatment is very thick and luxurious, with great slip for easy application and superior detangling. Put your comb away and just use your fingers! Ingredients: Aloe barbadensis (Aloe Vera) Juice, Behentrimonium Methosulfate (and) Cetearyl Alcohol, Butyrospermum Parkii (Shea Butter), Simmondsia chinensis (Jojoba) Seed Oil infused with Emblica officinalis (Amla) Fruit Powder, Acacia concinna (Shikakai) Nut Powder, Bacopa Monniera (Brahmi), Eclipta alba (Bhringraj) Powder, Symphytum Officinale (Comfrey), Avena sativa (Oatstraw), Thymus Vulgaris (Thyme), and Rosmarinus officinalis (Rosemary), Olea europaea (Olive) Oil , Agave nectar, Limnanthes alba (Meadowfoam) seed oil , Stearyl alcohol, Argania Spinosa (Argan) oil, Theobroma grandiflorum (Cupuacu) Seed Butter, Glyceryl stearate, Daucus Carota sativa (Carrot) seed oil , Caprylic/Capric Triglyceride (and) Achillea millefolium (Yarrow) Leaf Extract (and) Salvia officinalis (Sage) Leaf Extract (and) Equisetum arvense (Horsetail) Extract (and) Utica dioica (Nettle) Leaf Extract (and) Lavandula angustifolia (Lavender) Flower Extract, Arctium lappa (Burdock) Root Extract, Matricaria recuitita (Chamomile) Flower Extract, Phenoxyethanol (and) Benzoic Acid (and) Dehydroacetic Acid, Fragrance, Tocopherol, Citric Acid . Thoughts: The treatment is a thick cream (see above images) and doesn't rinse easily. It has a strong tea fragrance, not a bad one, but it does linger. It's somewhat moisturizing, but I have cheaper conditioners and deep treatments that do a much better job. This one just is not for me. I've previously attempted to use it up by mixing it with my semi-permanent colors, that worked to thicken the color products. I will say though, I'm very impressed with the ingredients. There are people that love Spiral Solutions Deeply Decadent Treatment as it's usually sold out. It retails for $19.50 (8oz) and is sold online by select retailers such as CurlMart.com. The Spiral Solutions site is currently down for maintenance. Would I repurchase? : No, it just isn't something I reach for. I tested this product for her. It made my hair dry as the sahara desert. I told her to add cetyl esters Panthenl to it. Needless to say she didn't and hence it doesn't really work for our hair type. Oh well. Yea, I don't know what to do with the rest. It's too thick to shave with and I'm not really interested in using it on my hair. I hate to waste products though. Maybe, I'll mix it in with a clay. I would love to try this if you want to get rid of it! Sorry, I've already given it away.